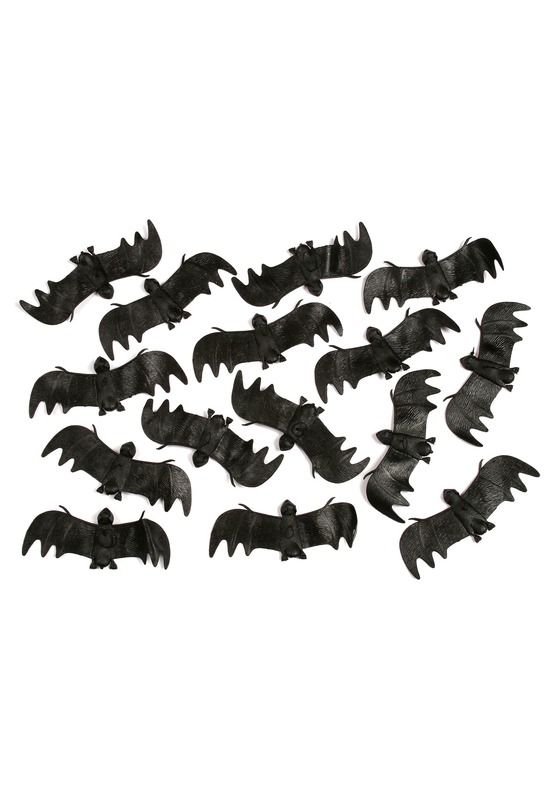 Each molded vinyl bat has a wingspan of approx. 5"
Folks tend to freak out just a bit when they hear about a flying rodent. But, that's hardly fair. Why should anyone judge a critter just because they've got a knack for a style of movement that the rest of us lack? Really, we figure folks are just jealous! It is time to excite your friends and keep your den looking like a ton of fun. And, this Bag of Black Bats is just the way to go! These funny flappers will make a great atmospheric addition to your place, whether you're looking for some Halloween flair or just want to convince the local bugs to think twice about invading your space! These fifteen vinyl bats are the perfect way to augment your atmosphere and give that extra spooky spruce to your space. And, better yet, they won't actually get caught up in your hair (unless, of course, that's the prank you want to play)!